Order has been restored. The Territorial Cup now resides back in its rightful place in a trophy case in Tempe. Players and coaches jumped and shouted on the field as the final whistle blew with Taylor Kelly taking the final snap in victory formation. 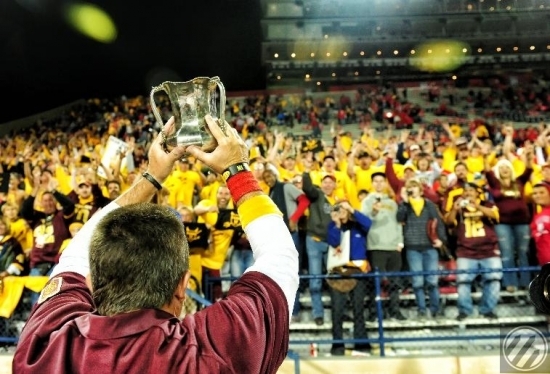 Coach Todd Graham, who has preached from the beginning of his tenure that this team belongs to all of Sun Devil Nation, carried the cup into the stands to share it with the elated fan base that stayed to celebrate after the game. With almost a year of alumni and fans hammering away about the importance of this game to Coach Graham, he had the look of a man who had a thousand pound gorilla freshly off of his back as congratulatory handshakes were abound. There was really no need to ask him, because it was evident to all that Graham took great solace in delivering the first haymaker against his coaching rival and former colleague Rich Rodriguez. And for us DieHard fans, making the miserable drive on I-10 East into Tucson before the game made the drive home much more gratifying as the lights of the big city appeared while still in celebratory mode well after midnight. As mentioned in the preview for this game, big plays, turnovers, and injuries were going to play an even bigger factor than normal in an emotional rivalry game like this. Huge momentum swings and capitalizing on mistakes were the resounding themes in the 2012 Duel in the Desert. 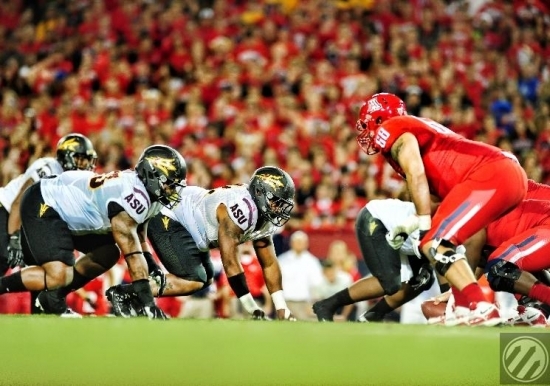 The ASU defense set the tone early and got a stop on the Wildcat opening possession. As predicted, the Sun Devil offense wanted to pound the undersized and depth-depleted Wildcat front seven between the tackles. Instead, ASU was unable to move the ball on the ground in the first quarter and could not sustain any meaningful drives as the UofA defense uncharacteristically shut down their opponents rushing attack. What struck me most about the ASU rushing attack being stalled was the number of times that QB Taylor Kelly gave the ball to his running back on what seemed like bad reads on the UofA defensive ends crashing down on the play. Normally, Kelly would make that read, keep the ball and run around the defensive end that had vacated his outside contain responsibility. I have to believe that after watching Kelly make good reads all season, giving the ball the running back every time early on (regardless of what the defensive end did) was instruction and game planning by the coaching staff to soften up the Wildcat defensive interior early. Pressure from Junior Onyeali on Wildcat QB Matt Scott at the beginning of the second quarter forced him to throw off of his back foot for an easy Keelan Johnson interception that energized the ASU offense. The ensuing Arizona State drive included first down completions to Jamal Miles and Rashad Ross, hard running by DJ Foster, and was capped by an electric 52 yard touchdown run by Marion Grice for a 7-6 lead and the first big shift in momentum. On the very first play from scrimmage, Matt Scott, under pressure from Will Sutton, threw another ball off of his back foot and floated one into the arms of ASU corner Osahon Irabor who had excellent single coverage on the play and hauling down his first interception of the year. 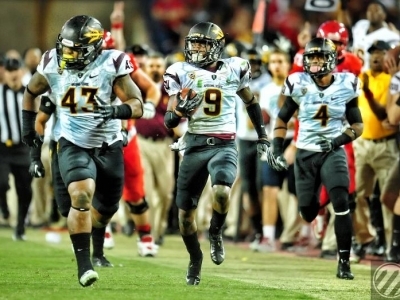 ASU drove 62 yards for another rushing TD by Grice and a 14-6 lead. As much as UofA owned the first quarter, the ASU defensive front created opportunities in the second quarter for two easy interceptions and were able to quiet an already confident and raucous Wildcat home crowd. On a later drive in the quarter, with ASU moving the ball effectively, Sun Devil receiver Alonzo Agwuenu fumbled at the Wildcat 23 yard line after a long catch and run. UofA gained back a big measure of that elusive momentum, and was able to capitalize on a short field goal going into the half down only 14-9. 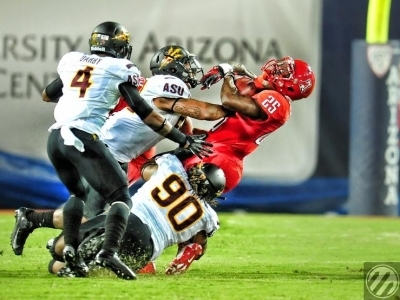 Enough can’t be said of the play of the ASU defensive front. Will Sutton suffered a toe injury causing him to leave the field on at least 3 occasions, but was able to return to be a huge disruption to the UofA offense making play after play. Carl Bradford could be found making several key stops in the backfield and was sure in his tackling in open space preventing big gains. And Brandon Magee, as predicted, put an exclamation point on this game with 17 tackles and was an absolute menace on defense for four consistent quarters. ASU opened the second half with a scoring drive that resulted in a Jon Mora field goal and 17-9 Sun Devil lead. UofA quickly responded with an 83 yard drive that ended with a 22 yard scoring pass on a pump fake to Austin Hill and cut the lead to 17-16. Arizona took control of the third quarter with another defensive stop and subsequent touchdown drive ending with a 40 yard wheel route pass to Garic Wharton to take a 24-17 lead. On the first play from scrimmage on ASU’s next possession, the snap to Kelly (who was lined up in the shotgun formation) hit Jamal Miles who was in motion for a fumble and ASU’s first turnover at their own 24 yard line. 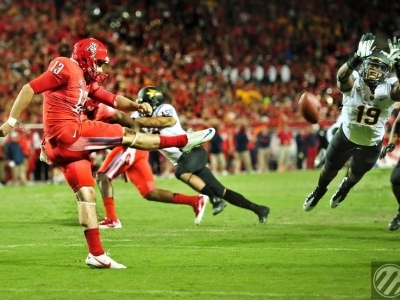 In what may have been the final momentum swing, Arizona was looking to put the game away, but ASU had it’s most important defensive stand and held Arizona to a 23 yard field goal resulting in a 27-17 Arizona lead heading into the fourth. In what would be the start of a big scoring spree, ASU converted a 39 yard field goal on their opening possession of the fourth quarter and trimmed their deficit to 27-20. On the very next Wildcat possession which included an effective drive to the Sun Devil 15 yard line, Keelan Johnson stripped Matt Scott causing a fumble with Deveron Carr recovering. With both teams attempting to recover the bouncing football, Will Sutton was able to knock a Wildcat defender out of the way, clearing a path for Deveron Carr to secure possession. ASU promptly drove the short field for a third touchdown run by Grice, who flashed some shiftiness in the open field on multiple runs. With a 14 point swing and the score now tied at 27-27, the ASU defense stepped up again forcing a 4th down deep in UofA territory. On the drive, Magee had a tackle for loss, and Carr made up for three earlier pass interference penalties with a great pass break-up on 3rd down. With Arizona using a roll-out, rugby style punt, Kevin Ayers was able to slip by Wildcat blockers for his second punt block of the year. This one was huge and the timing couldn’t have been better. ASU took possession at the Arizona 8 yard line and Cam Marshall ran it in on the next play, untouched for a 34-27 Sun Devil lead. On the next Wildcat possession and desperately needing a score, they were finding success in the passing game until ASU defensive back Robert Nelson intercepted a deflected pass and raced down the sideline 66 yards before being tackled at the 2 yard line. The Sun Devil sideline went nuts and Coach Graham immediately came over to talk to his defense for the next series. “Nobody gets behind you” he shouted to his secondary. Three plays later, backup QB Michael Eubank kept the ball on a sneak for a touchdown and the Sun Devils took a commanding 41-27 lead with less than three minutes left in the game. UofA was able to take the next drive for a quick touchdown on what looked like a blown coverage to cut the lead to 41-34 with 1:51 left on the clock and with neither team having any time-outs left. The Wildcats attempted an unsuccessful onside kick, and Taylor Kelly was able to line up in the victory formation to run out the remaining time on the clock by taking a knee on the enemy turf. There were so many phases and momentum swings in this game that it really was a tale of four complete quarters. ASU was outscored in the third quarter 18-3. In the fourth, the Sun Devils went on a 24 point tear after converting on a fumble, punt block, and interception, outscoring Arizona 24-7 in the final 15 minutes. These teams knew each other well going into this game, and ASU showed some wrinkles on both sides of the ball that the Wildcat coaching staff was not prepared for. Facing the daunting Wildcat passing attack, Robert Nelson played the nickel back position, often leaving him in single coverage on the best UofA receiver Austin Hill. Nelson had a great game, capping it off with the interception return to the Arizona 2 yard line for what may have been the play of the game to seal the victory. ASU also employed a four down lineman front more often than we’ve seen this season, and did a great job of disguising blitz packages. Offensively, there were several triple option plays with Foster and Grice both lined up in the backfield. Marion Grice was nothing short of amazing with 174 total yards (156 rushing) which was good enough for game MVP honors. In all honesty, there were at least four Sun Devils that could have justifiably been named MVP. After many questioned Taylor Kelly’s ability to lead this team earlier in the season, the redshirt sophomore maintained composure, extended plays, and (unlike his counterpart) didn’t turn the ball over on Friday night. In a long list of classic moments throughout the history of this rivalry, there are several from the 2012 installment that will go down as some of the greatest. Whether it was the Carr fumble recovery in the fourth quarter, the Ayers punt block or the Nelson interception return, the Sun Devils owned the fourth quarter and would not be denied the Territorial Cup this year. In a roller-coaster season where this team faced plenty of adversity, and a season that had left many in Sun Devil Nation still unsure of how successful this team could be, all the time and hard work that was put in by the team paid off in the fourth quarter of the most important game of the year. And as Coach Graham couldn’t wipe the smile off his face and proudly shared the Territorial Cup with the Sun Devil fans, I have a feeling that he knew this moment was coming all along. 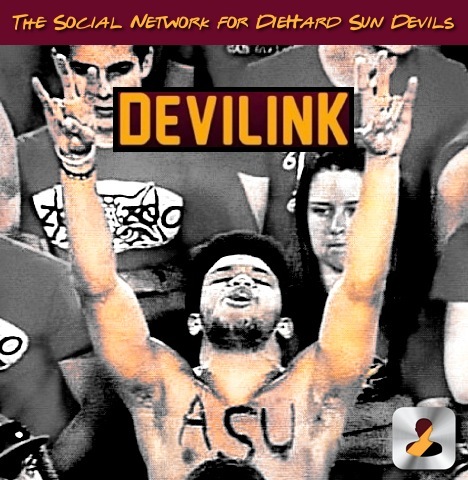 Discuss this year’s Territorial Cup, the upcoming Kraft Fight Hunger Bowl and Recruiting developments on DEVILINK.